As far as wildlife goes, insects are surely the backbone of the natural world. They provide the majority of plant pollination that occurs, they are the main source of food for an untold number of birds, mammals, reptiles, amphibians, and arachnids. Insects help to decompose waste materials. They fly, crawl, and swim. There are estimated to be more than 30 million different insect species, and most of them have never even been described (identified as a new species). Insects can be found on every continent, and in nearly any habitat on the planet, and our understanding of these incredible little creatures is only in it’s infancy. This album is mostly characterized by macro pictures of these beautiful creatures which are all around us (yet rarely observed) in day-to-day life. A Chinese Praying Mantis, possibly day-dreaming about what it's like to be a butterfly or some other creature? Who's to say. Photographed in Sunbury, PA, USA. It wasn't the X-files that convinced me aliens exist....it was this Chinese Praying Mantis. She's in the process of cleaning her pedipalps (claws), while perched on flowering Russian Sage. Photographed near Selinsgrove, PA, USA. 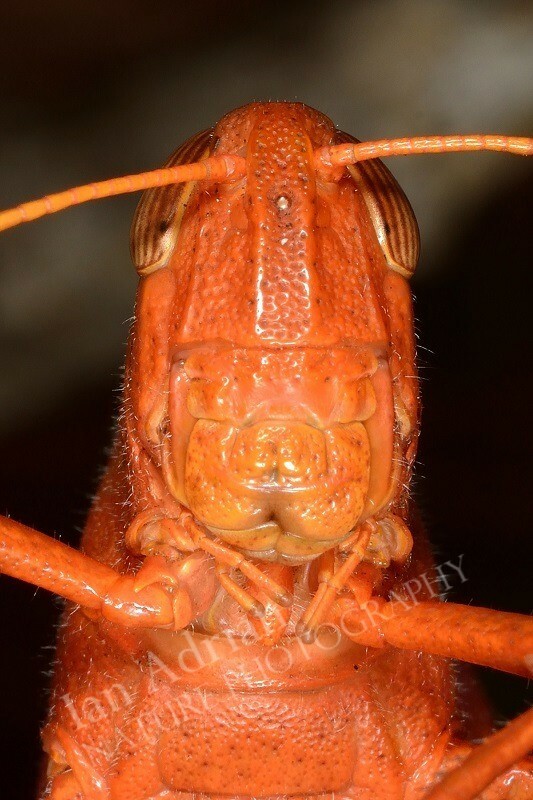 This large, orange grasshopper (species unknown) made the perfect macro photography subject, as it hung from a stick in the process of molting (shedding it’s exoskeleton). Photo taken at Lake Louisa State Park, FL, USA. A tropical cricket (species unknown), extremely well-camouflaged against tree bark. I barely noticed this master of disguise, even after looking straight at it. Photographed at Dos Brazos de Osa, Costa Rica. Although they do their share of pollinating and even look cute from the right angle (please note: this is not the right angle), Tachinid Flies are parasitic to a plethora of other insect species. They will lay eggs inside the unfortunate host. These eggs will hatch into ravenous larva that begin eating the poor thing, from the inside. Photo taken in Winfield, PA, USA. This grasshopper chose the perfect location for it’s superb camouflage! Photo taken in Bald Eagle State Forest, PA, USA. A Halloween pennant dragonfly, surrounded by it's natural environment. Photographed in Loyalsock State Forest, PA, USA. When closely inspecting a purple coneflower (echinacea), the plant has a very alien appearance. This wild honeybee no doubt had quite a plunder at this enormous flower! Photo taken near Hartleton, PA, USA. A lubber grasshopper, back-dropped by it's natural environment. Photographed near Hartleton, PA, USA. These tiny, beautiful sweat bees go by many names, “Green Metallic” being one. Extremely effective pollinators, these insects collect both pollen and nectar to feed their young. Shown on mint flowers. Photo taken in Winfield, PA, USA. On rare occasion, a photographer must quite literally put their flesh/blood into the efforts of a picture. This grasshopper was proving itself to be a challenging photography subject, until I had the thought to stage some shots from the end of my finger. My subject was quite content to rest here, and after a few seconds, I knew why when a sharp pain visited my fingertip. I let him/her continue to munch, snapping my shots one-handed. Photo taken in Bald Eagle State Forest, PA, USA.